Time to go back to school. Riding school. I know some of you think I should go to writing skool but my grades aint gud enuf. Oh well. A lot of years ago I attended the Original California Superbike School run by Keith Code out at the now long gone Riverside Raceway. It was a great day. I was just making the transition from desert racing to roadracing and what an eye opener it was. The day was spent on a Kawasaki KZ550 and in a make shift classroom. At the end of that day I had my AFM roadracing license in hand. I also had a head full of info that I still use to this day. Years later, a lot of years later, I put my son in Superbike School. He was a good rider when he went in, he came out a much better rider. He too went on to roadracing with some moderate succeses…he and I and a couple of friends got 3rd in Middleweight Superstock at the WERA 24 Hour race at Willow Springs. At this years MotoGP race at Laguna Seca I ran into Keith and told him how much I remembered and still use from his school…27 years ago!! !…he told me that he had met a couple others that had attended the school way back when. He was pretty stoked. Before we parted I told him about our podcast and asked if we could get together for an interview, he was up for it, I gave him my card and hoped for the best. The Tuesday after the race my phone rings and on the other end is Keith Code. “When would you like to get together for an interview?” “Whenever is good for you” says I. A couple of days later I spent the morning with Keith at his home office. I took the picture of me at school that day back in 1981, he was pretty surprised. I was riding bike #5..he told me that they had recently found and bought bike #1 from back then. We had a great interview, a great time and I truly believe I have made a new friend. Keith Code is a very interesting man. 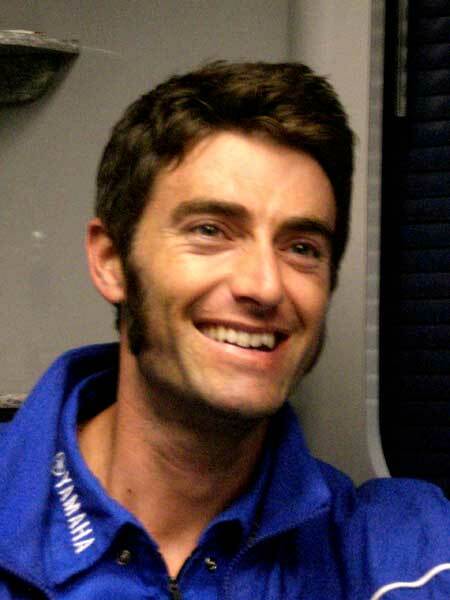 He is constantly thinking of ways to improve the Superbike School and riders riding skills. His greatest joy is the success and happiness of his students. I admire Keith Code a lot, I have for 27 years. This entry was posted in Helmet Time, motorcycle racing on July 30, 2008 by themotoworld. A week ago I was sitting in the Media Center At Laguna Seca and wandering the pits scrounging up interviews. As I have said before, I have been going to Grand Prix races at Laguna Seca since the late ’70’s I have hundreds of slides (remember those?) of Kenny Roberts, Eddie Lawson, Wayne Rainey and more. Some years ago my good friend Craig and I got together for a slide show of all our pictures. A few hours, a bunch of stories and a lot of beers later we were ready for a road trip to Laguna Seca. Fast forward to the 21st Century. I work in the motorcycle biz, so for the past couple of years, in one form or another, I’m working at the race instead of cruising around eating fried Calamari, Kettle Korn and drinking cold (overpriced) beers. Am I complaining? Nope. But it is a different experience, and one that I completely enjoy. When you are at a race track, the sounds, the smells, the crowds, the general vibe is always exhilarating and it is never boring. This year, being part of the media circus was a unique experience of it’s own. Doing interviews is always interesting…research, scheduling, timing, some are great, some are flat..but always entertaining. 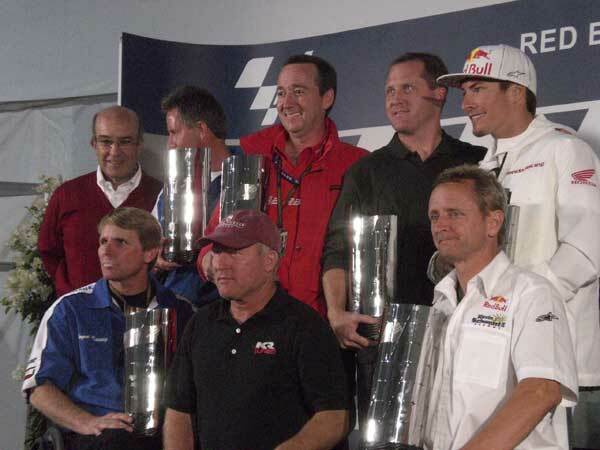 A real highlight this race was the press conference with all the American Grand Prix Champions. Kenny Roberts,Freddie Spencer, Eddie Lawson, Wayne Rainey, Kevin Schwantz, Kenny Roberts Jr and Nicky Hayden..all together in one place at one time. All telling some stories and laughing with and at each other, a truly memorable moment in racing. 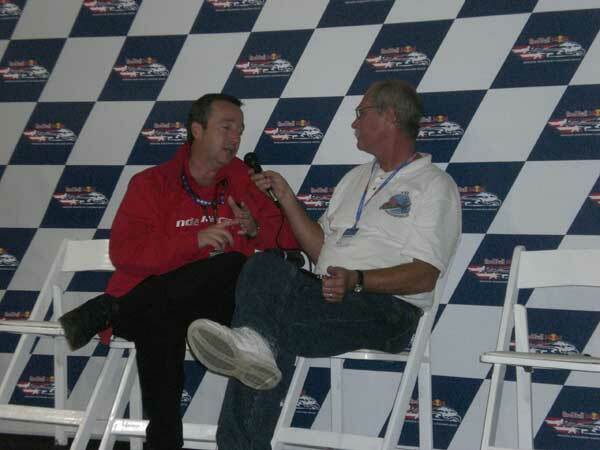 After the special awards were presented to the American Champions, I had a unique opportunity to listen in on Freddie Spencer and one of his former team members remembering old times and telling stories and then the highlight..I had a 15 minute sit down with Freddie alone. What a great guy. Engaging, personable, friendly and willing to share stories. I treasure that time and Freddie said he would be willing to do it again, we both had a good time. Another good thing about the race weekend was seeing and hearing my friend Brian Drebber doing the announcing. He’s been around racing a long time and when he’s not doing announcing work he’s helping out Corona Extra Racing’s Matt Lynn on his Superbike. Brian is a motorcyclist Heart and Soul. After the races were over, it was pack up the bike and head home. Yeah, we rode..carrying two computers, recording gear and everything else. Five pretty chilly hours later it’s hot tub and a glass of Kentucky’s finest time…gotta take the chill off ya know. 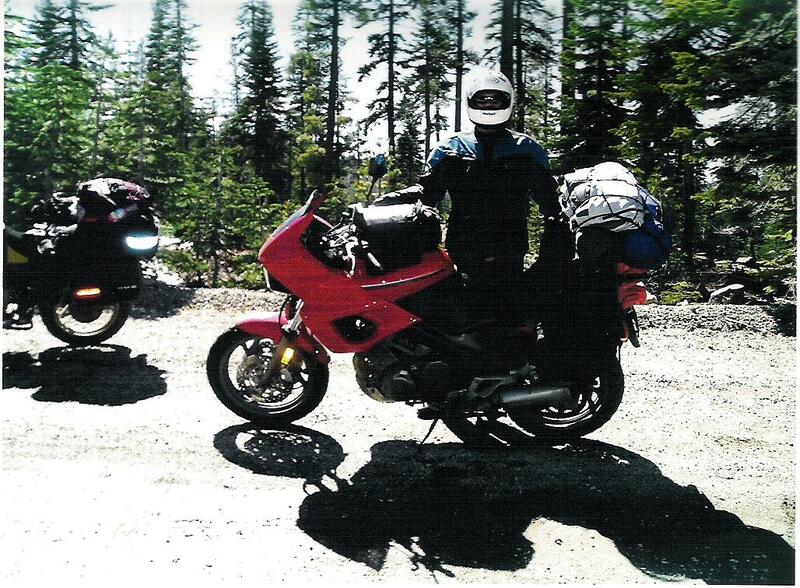 This entry was posted in Helmet Time, motorcycle racing and tagged motorcycle travel on July 26, 2008 by themotoworld. Note to self: learn to speak Italian. Or French, or Spanish, or German. To really enjoy all that goes on in a Media Center at an International Motorcycle Race, knowing another language would be quite handy. Today here at Laguna Seca has started out pretty darn cold and wet but at least no fog to close the track. We got here very early this morning to check in with Valentino Rossi’s communications manager to see if and when we were going to be able to interview the great one. William is a very nice man and quite enthusiastic about podcasting, but…he said maybe, probably not. Interviews with the multi time world champion are all scheduled at the beginning of the season. Ah well, better luck next year. William did however give a ray of hope. The GP season is taking its summer break after this race and maybe we could do it over the phone or via computer or send some questions Valentino will do kind of a free form one way chat then send me the file to put on the podcast. That’s kind of a cool thought. As Heather and I do more of the big races we’re making some new friends and contacts that are very helpful. The top of that list is Stephanie from Honda. She and the rest of the team really do exemplify the old ad slogan, “ You meet the nicest people on a Honda”. On short notice she got us time with Erion Honda AMA Supersport Champion Jake Zemke. I have always admired Jake and his story is a great racers story. I think you’ll love the interview. Before we met up with Jake we headed up to the famous ‘Corkscrew’ corner for some pictures. It’s a long hike up the hill, I‘ve got to exercise more!! Between the two of us we got some good shots. As I am writing, Heather is editing photos to put into the photo gallery on the website http://www.themotoworld.com, some of them are quite good for a little point and shoot camera. Actually, they’re good because Heather is a very good photographer. It’s lunchtime now; Randy Mamola (a very famous former racer and now TV announcer) is taking people who have donated a lot of money to a certain charity, on two up rides around the track. And while he is doing that it’s time for me to line up more interviews. This entry was posted in Helmet Time, motorcycle racing on July 24, 2008 by themotoworld. It was a dark and stormy night, no wait, wrong story. It was a cold and wet morning. 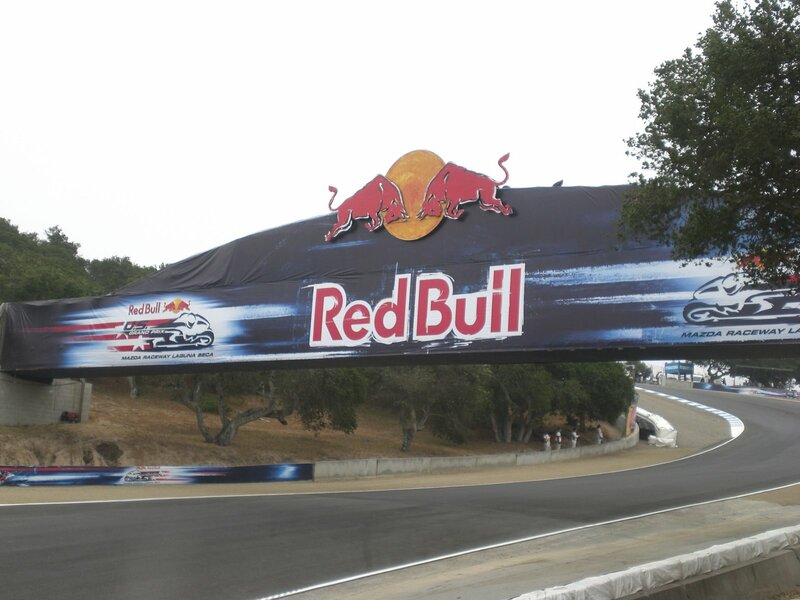 Yeah that’s it, the fog had settled in so much that Superbike practice here at Laguna Seca was called off. You can’t see the track! So, time for the first interview of the day. First on the list, Yamaha Superbike pilot Eric Bostrom. Heather and I met him in the luxurious Yamaha team hauler. He is a great interview, we had a lot of fun, we talked motorcycles, family, surfing…a good time was had by all. So far the Yamaha and Honda guys are the most fun to be with. Now it’s time to cruise the MotoGP pits and see whom else we can scare up to talk with…wish me luck. 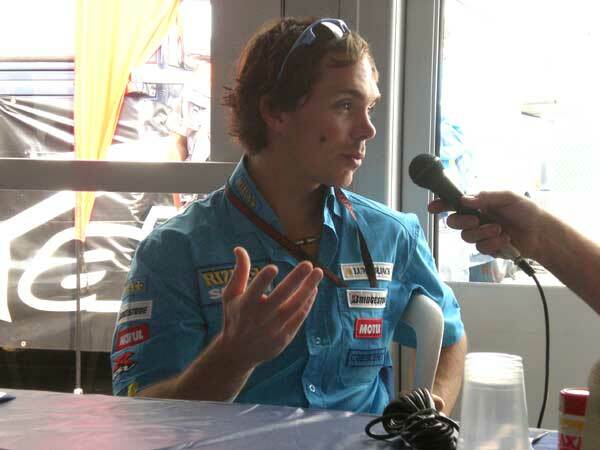 Luck was shining down; we have an interview with Suzuki MotoGP ace Chris Vermuelen later this afternoon, now it’s off to track down Valentino…hey, who can resist me. We took some time to watch MotoGP qualifying, pretty darn exciting to say the least. Check this out, as we all know, right now Ducati’s Casey Stoner is on a tear. It’s almost like everyone else is racing for 2nd (remember the years that Rossi was on fire? ), Casey Stoner has broken the track record here, are you ready for this, 8 times this weekend!!! Six times today! Unreal. But as we all know Valentino is no slouch. Valentino doesn’t like Laguna Seca all that well but you couldn’t tell it today, he is on the front row right next to young Mr. Stoner. Australian Chris Vermuelen is fast. He’s also a really nice and fun young man. We spent about 20 minutes together talking about racing and how he got started and then the conversation turned to his other love…American Hot Rods. Listening to the stories of he and his dad restoring and customizing these cars was a blast. I asked him if he would come to California in the off season and help me restore my old ’63 Fairlane. Then it was show and tell time, pictures of his favorite cars on his Blackberry. You can hear which ones on the podcast. The MotoGP press conference after qualifying was good fun, I’ll have bits and pieces of that on the podcast too. Done for the day. My crystal ball shows dinner and bed in my future. I’ll talk with you tomorrow. Ride safe, ride fast, I’ll see you on the road. This entry was posted in Helmet Time on July 20, 2008 by themotoworld. Those foreigners, it’s like they have a different word for everything!! (thank you Steve Martin). Here we are covering another race, this time the MotoGP circus is here at Mazda Raceway Laguna Seca. It’s great to be at another World Event, the media center is alive with more foreign languages than a U.N meeting. Writers, photographers, TV, and little ‘ol podcasters…us. The lessons learned at Miller Motorsports Park were invaluable. Getting credentials through Dorna (the owners of MotoGP) is quite a bit more difficult. 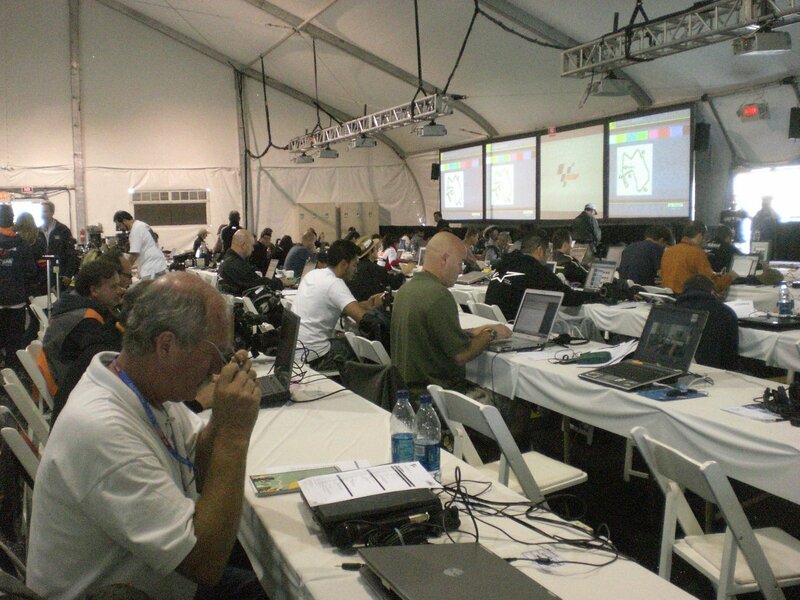 With the great help of Press Officer Ed Nichols here at Laguna Seca, we finally got them and into the media center we go. Thank you Ed. The center here is big, it has to be, MotoGP brings a lot more attention. The video screens are giant, showing the track sessions, timing (in detail) and every bit of information an information junkie (journalist) could want. Oh, and free Red Bull…this is the Red Bull Grand Prix you know. 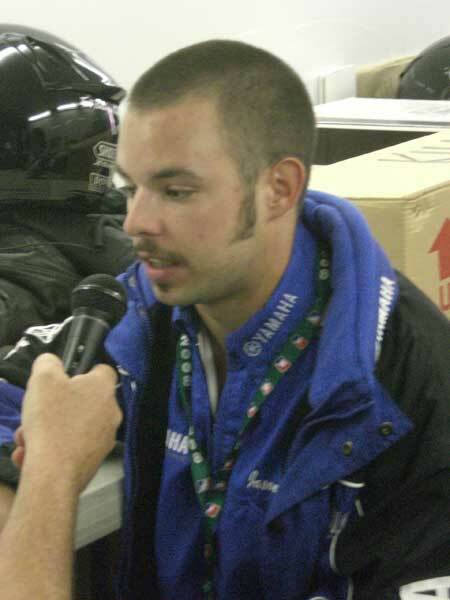 After getting settled in it was off to Yamaha to interview Superbike pilot Jason Di Salvo. What a great kid, we had a really good time. Jason has a very interesting story, you can listen to it next week on the podcast. Next on the hit list, Suzuki ace Tommy Hayden. After watching his brother Nicky run a very successful practice session, he and I sat down and had a bit of a chat. He’s just coming back from a pretty nasty spill so it’s really great to see him back on his bike. He was anxious about this weekend because it would have been the first time in 10 years that he would have missed the race. We wound up the day at the track in a great way. 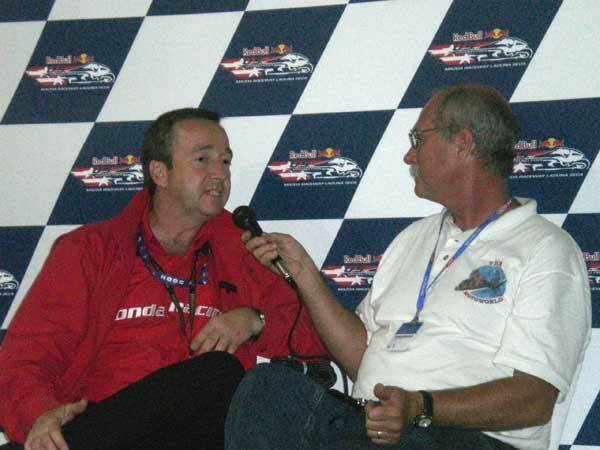 I sat down with multi time World Champion and great guy, Freddie Spencer. What an interesting man. Prior to my talking with him, I was listening in on a conversation with he an old friend and team member, it was fascinating, two old friends talking story. Freddie and I talked a good 20 minutes about the year he won both the 250cc and 500cc World Championships. 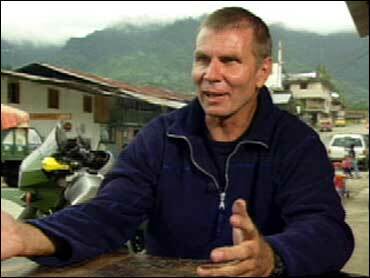 Freddie is a great talker, no wonder he is a very popular Speed TV announcer. Well, next week you can check all these great interviews on The Motoworld podcast. I hope you all listen. Now it’s off to dinner at our favorite place in Salinas, the Pennyfarthing Tavern. Ride safe, ride fast and I’ll see you the road. This entry was posted in Helmet Time, motorcycle racing on July 20, 2008 by themotoworld. The time has come to say good bye to a very good friend. My Yamaha TDM850. It’s actually my second one. The first one I bought from one of my racing partners who had recently traded up to a BMW GS1150, nice bike but really big..I liked the TDM a lot. A little haggling and the TDM was mine. I had forgotten how much fun John had doing wheelies (the TDM wheelies real easy!) so first stop was new fork seals. The Red Sled and I put a lot of miles on real quickly. Never hiccuped, never did anything weird, just a great bike. Until…one morning on my way back down from visiting my sister in Northern California, a truck and I decided we should become close friends at a freeway onramp. Bike was pretty banged up and so was I. After it sat in the garage for a few months it was passed on to a friend of mine who had bought one with a blown motor. A little transplant surgery and Jeff is a TDM freak too. One day a posting on the TDM list showed up…’1992 TDM 850, low miles, needs minor work but runs..$500′. An e-mail, a phone call, a couple of tanks of gas and I’m the owner of another red TDM. The ‘minor work’ included a couple of new electric components and tank of gas. Cheap. So,here I am seven years and around 60,000 miles later saying goodbye. That TDM has taken me all over the western U.S and pretty much trouble free. Heather and I had our first road trip together, camping up on the Kern River, on the TDM. We have traveled mountains and deserts with friends, our son and his wife rode to Laguna Seca on it. I have ridden it in waist deep snow, I commuted to work on it ( I ride ‘The Mighty 350’ nowadays..better mileage) and even considered making a ‘track day bike’ out of it. All in all it has been a great bike. Why am I selling it? Good question, but I believe the new owner will give it a good home. So, you know what…I’m going to get my helmet and take it out for one last ride. Maybe one day a TDM will show up on e-Bay or Craigs list and…nah. This entry was posted in Helmet Time on July 13, 2008 by themotoworld. I’m a news junkie, I wake up sometimes at 3 or 4 in the morning and turn on either CNN or the BBC World Service. Over the past few days there has been a lot of press over the newly released hostages out of Columbia. I have been fascinated by their stories. 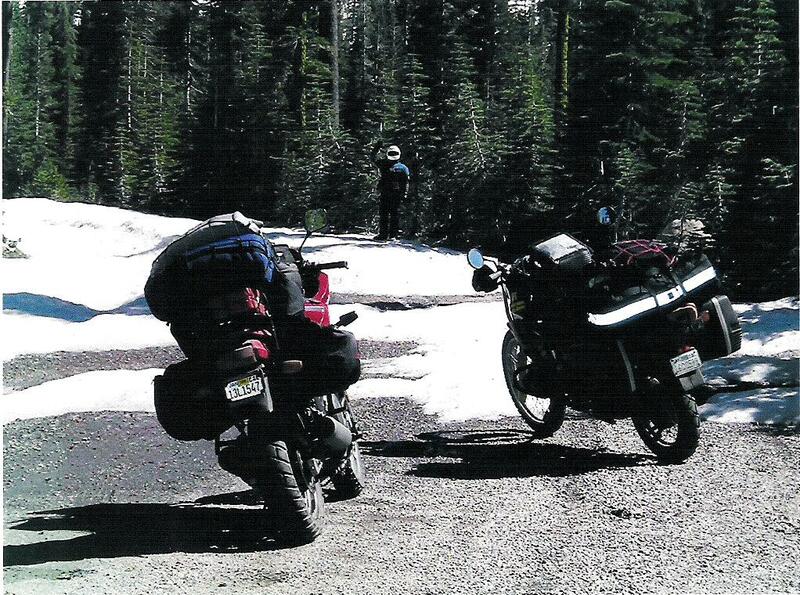 But…over a year ago I spent time on the phone with Glen Heggstad, Moto Traveler and author. His book, Two Wheels Through Terror, is a must read. You can find his book on Amazon.com or my favorite place, www.whitehorsegear.com Glen too, was a hostage in the jungles of Columbia and what a story he tells. You can hear a good portion of it on our podcast, www.themotoworld.libsyn.com, give it a listen. This man is truly one of my hero’s. He started a trip from here in California to Tierra del Fuego..the southern most point in South America. What a dream for all of us that travel on a motorcycle. Unfortunately, in South America, he got sidetracked as a prisoner by Columbian Rebel forces for a quite a while. Glen was finally released and through the help of a whole lot of people, was able to continue his quest. It really is a fantastic story and Glen is an amazing man. Read the book, listen to the podcast. Glen just got back from a year long journey through Southeast Asia. We spoke a couple weeks ago while he was still in Asia. He is home in Mazatlan Mexico now and we will be having another visit together in the next few days. I would imagine he has some interesting insights to what Ingrid Bettencourt and the three American men went through during their time as prisoners. This entry was posted in Helmet Time on July 11, 2008 by themotoworld.